How do I manually add products? This article is a quick reference on how to add your products manually (without CSV import) to your 3dcart store. We will go over all of the main fields involved in adding a product – please keep in mind there are many more features available to you for this process, so the more information you add, the more descriptive your products will be. This will create a base product for you to edit with your details. You will see a page with a series of tabs found along the top. The very first tab you see will be the information tab which will be the focus of this article. This is the item's Store Keeping Unit and is your store's unique identifier for the product. This is the product's Global Trade Identification Number and is typically the unversal identifier for the product. For example, the product's UPC number could be considered a GTIN. This field will be used for the product's name as you would like it to appear on the store front. This field is used to provide a short summary of the product's description. It typically will appear on search results when a search is made on your store front. Use this drop down to assign the product to one of your store's product manufacturers if you have created them. Use this drop down to assign the product to one of your store's distributors if you have created them. 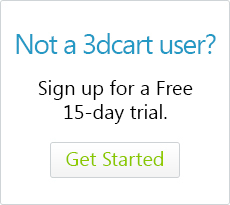 The Distributor and Manufacturer choices will be ones you have already created in the Settings ->General ->Distributors and Settings ->General ->Manufacturers sections of your 3dcart Online Store Manager. Choose an existing category to add this product to in the Category field by clicking +Add, then selecting the category. You can choose more than one category to add this product to. Your category choices will be ones you have already created in the Products ->Category section of your 3dcart Online Store Manager. This is how much the product costs you as merchant. This is an internal number and typically used for sales vs profit reporting. This is how much the product sells for at other stores. On the store front, the "Retail Price" will be shown with a strikethrough indicating that the product is cheaper on your store. Furthermore, the store front will display a "Your Savings" message to show how much cheaper the price is when shopping your store. This is how much the product sells for at your store. While this field is for the price of your product when it is on sale. To mark the item as being on Sale, simply mark the "Item on Sale" checkbox. This section will allow you to set some individual display and function parameters for the product. Mark this checkbox if you'd like the product to be tax-exempt. This will make it so that the product is not factored in to the store's tax calculation during checkout. This checkbox allows you to set the item as "not for sale" which will allow you to display the product, but not sell it. This checkbox will omit the product from search results when a search is made on your store. Mark this checkbox if you need to hide the product from view for any reason. This allows you to keep the product in your catalog (rather than deleting) if you need to take it out of view. This checkbox will be used if you are creating a Gift Certificate product. Marking this checkbox will add a To: and From: form onto the product so that the shopper can address the GC to another person. This checkbox will mark the item as a "Featured Item" on your store's home page. As an alternative to the Home Special checkbox, you can also set your store to randomly display all of your products as "Featured Items" on the home page. To use this option, go to Modules in your Online Store Manager, and search for "Home Specials." Here you will see some configurations for the product that pertain to the way shipping is calculated when the item is purchased. If you would like to add an additional markup to the shipping rate specifically for the item, enter the amount here. Use this setting to configure whether the item (by itself) is typically shipped in one container, or if it uses multiple containers. These fields are for entering the weight and dimensional information of the product when it ships. These are typically sent to your store's shipping carrier in order to return real-time shipping rates. Mark this checkbox if you would like to omit the product from shipping calculation. This will offer the shopper free shipping on the item itself. Use this checkbox if the product absolutely needs to ship by itself. If the product is purchased along with other items, then shipping will be factored for this one product shipping in a separate container. As mentioned, the product dimensions, (weight, height, length, etc) are typically used for real-time shipping calculation. When the item is ordered, the store will send this information to the respective shipping carrier and calculate rates based on the weight and dimensions of the product. Whether you need to enter the numbers in standard (lbs, inches, etc) or metric (kg, cm, etc) units depends on your specific carrier. If your carrier deals with metric units (like AustraliaPost, or RoyalMail/ParcelForce), you will enter your measurements in metric units. If your carrier deals in Standard measurement, you will enter standard units. This section can be used for setting how inventory control is handled for the product. Set the action that you would like to occur when the item reaches 0 in stock. Shows the item as on "Back Order" (to indicate it is out of stock) but allows purchase of the item so that the order can be filled when stock is replenished. Shows the item as Out of Stock but allows the shopper to sign up for a waiting list to be notified when the item is replenished. Enter the number of stock you have on hand for the item. As you replenish stock, you can update stock via this field as well. If you would like to receive alerts from your store when you are running out of the item, enter a number here. When stock reaches below this number, the store will send you a notificaiton. 0 turns off the function. Use these fields if you'd like to have the product display specific text when the item is In stock, Out of Stock or on Back Order. The stock messages will override the store's global stock messages which can be edited by going to Settings ->Design ->Store Language. This field will allow you to enter an extended description of the product. The description will appear on the product's listing page in your storefront. This field will take either straight text or HTML coding to format your description. Furthermore, you can use WYSIWYG on this field to help you format the text as needed. Words and phrases entered here will be added to the product listing page's Metatags section and will assist in searches and SEO. Multiple keywords and phrases should be separated by a comma. Once you have completed setting up the product's information tab, click "Save" at the top right to commit your changes. Make sure you click save before navigating away from this page. Otherwise, moving to another page or tab before saving will discard any unsaved information entered.